BBCanada.com | Welcome to Merrickville! Ah, Merrickville – can't wait to visit again! Ah, Merrickville – I've heard so much about it and can't wait to visit! The 'Heart of the Rideau' is a phrase that not only physically describes where this area is -- but also expresses the warmth of your welcome to our place in Eastern Ontario. Your stay in Merrickville is truly a Canadian experience you'll remember. The 202 km (125 mi.) 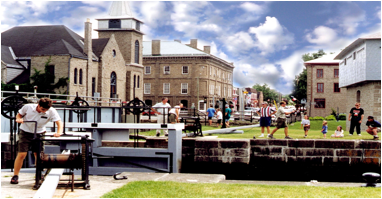 long Rideau Canal between Kingston and Ottawa was named a UNESCO World Heritage Site in 2007, the first in Ontario! With this award, the area is attracting more domestic and international travellers but is still relatively crowd-free. Merrickville, also dubbed 'the Historical Jewel of the Rideau', has become a favourite weekend getaway spot on the gorgeous Kingston-Ottawa Rideau Heritage Route. Located near the mid-point of the canal system, Merrickville evokes fond memories of times gone by. You won't find any parking meters or traffic lights here but you might find the Town Crier (the man in red below) and very friendly villagers. Considered to be one of Canada's best preserved 19th century villages, Merrickville boasts uniquely restored and exquisitely maintained homes, all within an easy walk around town. The Merrickville Historical Society's website contains much of village's history as well as a pictorial historical walking tour. Central to the Village is The Blockhouse, built in 1832 and now a museum of fascinating local artifacts. The locks of the Rideau Canal are fascinating to watch and operate today just like they did over 175 years ago. At one time, Merrickville had the largest department store between Chicago and Montreal. That building now contains an inn, fine dining restaurant with ballroom, a pub as well as the Knock-Knock shop. It's well worth visiting the shop's second floor to see each room's distinctive ceiling. What you'll find in Merrickville is a wonderful antidote to the hustle, bustle and expense of a city. You can usually find free parking right on the main street, which is lined with restaurants and unique shops featuring local artisans as well as products from around the world. Rowland Leather has been creating award winning locally made purses and other leather items for 35 years. Mrs. McGarrigle's Fine Food Shop is a foodie's mecca and is known for their award-winning mustards and chutneys as well as food tastings, demos, classes and kitchenware. An area called 'Merrickville South' is well worth the two block detour south of the main shopping area to see some world famous artisans like Kevin Robert Grey, Claudette Hart, the infamous “Gourd Lady”(shown below) and Laura Starkey Studios, only three of the 'must-see' artists to be found there. There's much more to discover. www.realmerrickville.ca will give you the details of the many artists and businesses in and around the village. 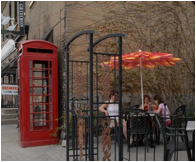 Merrickville has one of the highest per capita populations of artists in Ontario. The Annual Studio Artists' Tour celebrates their 25th season this year. This tour is always held on the last weekend of September and the first weekend in October (Sept. 26-27 and Oct. 3-4, 2009). For a village of its size, there's a remarkable range of dining options in Merrickville. You can choose from three pubs, where you can get outstanding pub fare, beer and other spirits. Or go for Italian cuisine or home made informal family dining. The Downtowne Ice Cream & Candy Shoppe offers to-die-for home-made ice cream and gelato in a huge variety of flavours, as well as an old-fashioned candy shopping experience – a place for kids of all ages. Fine dining is available at a number of elegant eateries at prices below that of major cities. And nothing beats a chip wagon's poutine and there's three to choose from. Many of these fine restaurants have outdoor patios for you to enjoy people watching and the fresh country air . Rideau Woodland Ramble (RWR) was named one of Canada's Top 40 Gardening Destinations according to Gardening Life magazine. 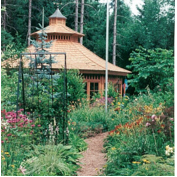 A unique plant nursery with display gardens that leave people gasping with envy, it is located just outside of Merrickville along the scenic County Road 23, aka Burritt's Rapids Road. RWR is just south of the pretty hamlet of Burritt's Rapids with it's old fashioned 'swing bridge' and Village Green. Along the way to the Ramble, you can picnic at the peaceful, picturesque Lower Nicholson locks – and view the remnants of Andrewsville, an authentic ghost town. Avid birders can look for the osprey nest on the winding road between the canal and river near these locks. Look for the historic checkerboard house as you negotiate the 'S' curve towards Burritt's Rapids on the country road south of the Rideau. To see the Rideau Canal close up, the Canal Gallery rents canoes and kayaks at very reasonable rates. If you're not up to paddling your own boat, then get on board the Rideau King - a 45 foot long vessel that tours three Rideau Canal Locks. Bird watchers can go on the Harriet By, an electric boat, to the Bird Sanctuary. For landlubbers, the Rideau Trail winds it's way round most of the nearby villages and hamlets and the trail is particularly spectacular during the fall colour season in September/October. If you want to go faster than walking, then take one of the many cycle routes that start and end at Merrickville – like visiting the quaint island of Kilmarnock where Kilmarnock Orchards' 25 different varieties of apples will have you spoiled for choices. If all this outdoor activity has you exhausted, then hopefully you've made an appointment at one of the local spas to get pampered and massage your troubles away. - Mrs. McGarrigle's Fine Food Shop's International Mustard Day Festival celebrates with mustard tastings, demos and appetizers on the first Sat. in August. The shop is open year-round and has something for everyone's palate as well as their world famous award wining mustards. 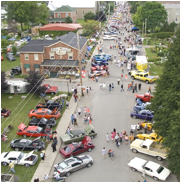 - Merrickville Cruise & Shop, now in it's 9th year, brings in the crowds gawking at the hundreds of immaculately restored antique cars and trucks, usually the second Sunday in July. - Merrickville Fair is typically the first weekend in August and is just good old-fashioned fun for over 170 years! The demolition derby is a key attraction as are the rides, food and other activities all near the Rideau River. - Jewel of the Rideau Antique Show is held at the Merrickville fairgrounds Aug. 22-23, 2009 and features dealers from Ontario and Quebec. - Merrickville's 25th Annual Studio Artists' Tour is on Sept. 26-27 and Oct. 3-4, 2009. It is always held on the last weekend of September and the first weekend in October with over 20 artists featured each year. - 13th Annual Eastern Ontario Postcard Show is held on Sat. Sept. 19, 2009 and is the place to see and buy thousands of postcards from around the world. - Christmas in Merrickville on Dec. 5, 2009, is the start of the holiday season and a party for all! Horse drawn wagon rides, Christmas carols, hot dogs over open bonfires, village and children's tree decoration contests, Breakfast with Santa and complimentary hot chocolate. It's an event not to be missed if you enjoy the old fashioned kind of Christmas in a quaint village. Merrickville is less than an hour’s drive from Canada’s capital city Ottawa, and the U.S.-Canada border. There's more than a day's worth of things to see and experience, so plan on staying a few days. 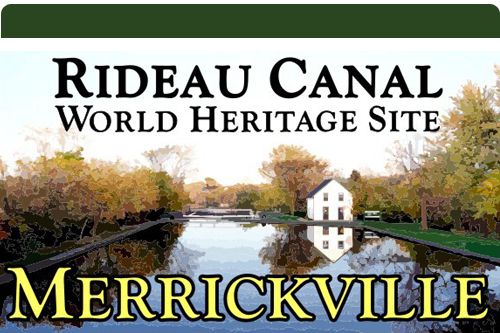 Please go to www.realmerrickville.ca for information on these events and more about the village of Merrickville. To find out where to stay in Merrickville at a lovely inn or B&B please click here!